lostchild2u has no other items for sale. 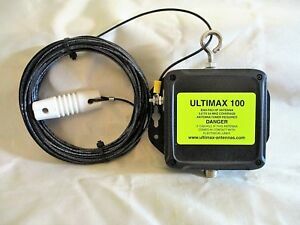 Well-Made Ultimax 100 Antenna Promptly Delivered; Great Seller; Thanks! The Ultimax 100 fit my needs to the "T". I wanted an antenna that I could run in my backyard and still please the wife! It is strung from our gazebo to the house on a slant. With the antenna tuner that I am using, it is achieving an SWR of 1.5 or less on all of the bands. 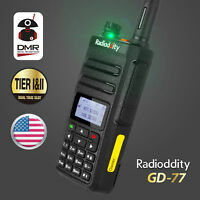 I am using it with an Icom 706 and an mAT-180H antenna tuner. I don't have anything to compare it to, but so far it suits my needs and having the feed cable on an end works great for me. The combination of the for 706 and the mAT tune automatically which is a real plus for me. I am using it as a base antenna. Note that the end insulator is plastic and a drill can easily open up the hole easily (did that to fit a clip thru it ot make it easier to mount when up on a ladder. Love that they packaged this antenna in a nice square cardboard box . This makes it very easy to store when not in use. 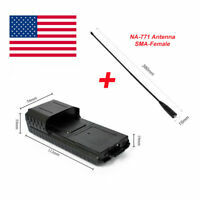 Antenna tunes quickly to set of 1.1 or 1.2 on all bands Great antenna !!! A Friend has one of these antennas in his attic and it performs fairly well with only 33 ft of wire. Well designed and built. This is my second antenna purchased from these folks, and I am just as thrilled with this one as I was the first. Highly recommended!